The Pentagon's latest annual report on the Chinese military for the first time outlined China's increased use of intelligence ships, known as AGIs, for spying. The AGI deployments indicate the ships are operating further from Chinese shores and also violating other nations' exclusive economic zones, or EEZs, a designation under the U.N. Law of the Sea Convention that China signed. According to the report, a Type 815A spy ship was spotted near Alaska in July 2017 apparently monitoring a "live test of the THAAD missile defense system." The Chinese ship, a Dongdiao-class spy vessel, sailed to a position near the Aleutian Islands for the test. The ground-based THAAD is one of the most effective U.S. missile defense systems and has been a major target of Chinese propaganda in attempting to coerce South Korea against deploying THAAD batteries there. "Chinese AGIs operated well beyond the first island chain in 2017," the report said, referring to the close-in string of islands stretching from Northeast Asia through the South China Sea. More recently, the Pacific Command announced that China dispatched an AGI near Hawaii in July to spy on the Rim of the Pacific international naval exercises. China was disinvited from taking part in RIMPAC as a result of continuing militarization of disputed islands in the South China Sea. The Pentagon report stated that China continues to challenge foreign military activities carried out by intelligence collection ships that is permitted by customary international law. The People's Liberation Army "recently started conducting the very same types of military activities inside and outside the first island chain in the maritime zones of other countries," the report said. "This contradiction highlights China's continued lack of commitment to the rules of customary international law." China is a signatory to the United Nations Law of the Sea Convention that permits military activities including intelligence-gathering ships. However, China has imposed domestic laws in its exclusive economic zones restricting intelligence ships and military survey ships. "At the same time, the PLA is increasingly undertaking military operations in other countries' EEZs," the report says. 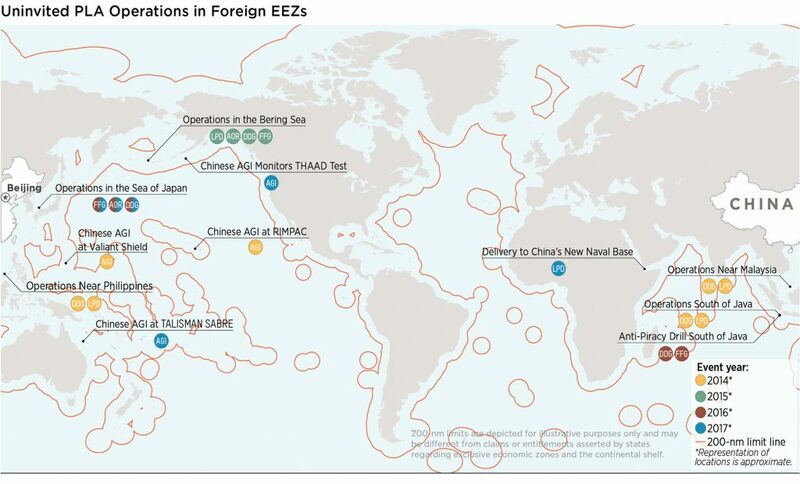 The Pentagon report includes a map showing PLA Navy military operations inside other nations' EEZs, including the July 2016 THAAD test near Alaska. Other uninvited PLA Navy foreign EEZ incursions involving spy ships took place near Hawaii during RIMPAC; near Australia in 2017 during the U.S.-Australian naval exercise Talisman Saber; and near the U.S. island of Guam during Exercise Valiant Shield in 2016. Additional PLA Navy EEZ incursions were detected in the Sea of Japan and Bering Sea, near the Philippines, near Malaysia, near Indonesia's Java, and near Djibouti on the Horn of Africa where China has its first overseas military base. Those ship incursions were carried out by Chinese destroyers, frigates, amphibious ships, and replenishment ships. A defense source told the Free Beacon that China's dispatch of AGI appears to be a bid to counter the U.S. dispatch of similar survey and intelligence ships near China. The Navy routinely sails its survey ships in the South China Sea, where China is militarizing disputed islands in a bid to take over the strategic waterway. Navy AGI also frequently operate near the northeast Chinese port of Dalian, a major submarine and warship base. "They routinely spy on areas near Guam, Hawaii, and Alaska," the source said. China also conducts intelligence-gathering around the world through its extensive merchant ship fleet as well as from its network of overseas container bases run by state-linked companies such as Cosco and Hutchison Wampoa. "These are fronts for the Chinese government," the source said of the companies. "Also, the Chinese just put whatever intelligence-gathering equipment they want on Chinese-flagged merchant ships, and at containers ports." Retired Navy Capt. Jim Fanell, former Pacific Fleet intelligence chief, said China's deployment of the intelligence "is just another example of PRC hypocrisy when it comes to adhering to the United Nations Convention on the Law of the Sea (UNCLOS)." "Beijing continually complains about the presence of U.S. intelligence, surveillance and reconnaissance platforms that have operated with the PRC's EEZ," he said. "Yet the PRC says nothing when their own ISR platforms operate within U.S. or other nations EEZs. The duplicity between the Communist Party of China's words and actions is evident to the world and erodes the world's trust in President Xi Jinping's claims commitment to a ‘community of shared human destiny.'" Rick Fisher, senior fellow at the International Assessment and Strategy Center, said China is stepping up global intelligence gathering as Beijing accumulates economic and political power and military networks abroad. "China's AGI intelligence collection fleet is growing rapidly," Fisher said. "Of its nine Type 815/815A dedicated AGI ships, seven were built in the last four years." A future follow-on class of AGI likely will be armed with lasers to add to the PLA's increasing space combat capabilities, Fisher said. "Inasmuch as they are all under central Chinese government control, it is likely that the PLA spreads electronic surveillance equipment broadly in its naval, fishing, and merchant fleets," he noted. "Eventually, China's maritime surveillance fleets may be as pervasive as that of the former Soviet Navy." 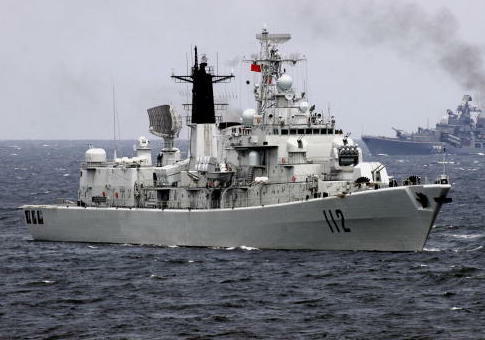 Fisher said the Type 815A, the ships seen near Alaska, Hawaii, and Guam, also often take part in exercises with PLA Navy combat ships, "an indication that the AGIs may assist with the targeting of long-range strike assets like the DF-21D and DF-26 antiship ballistic missiles." Disclosure of the increased Chinese naval spying comes as the Navy's top admiral said earlier this month that Beijing's warships are now routinely operating in the North Atlantic. Adm. John Richardson, chief of naval operations, said Chinese military operations from the North Atlantic into the Mediterranean Sea have created a new dynamic. "Even five years ago, we wouldn't have seen anything like this," Richardson told the Voice of America. Richardson said the Chinese Navy is now a global force both "ready and capable" of operating globally. "They're certainly a pacing competition for us in terms of the naval threat," he said. This entry was posted in National Security and tagged China, Navy. Bookmark the permalink.